Siebe introduced various modifications on his diving dress design to accommodate the requirements of the salvage team on the wreck of HMS Royal George, including making the helmet be detachable from the corset; his improved design gave rise to the typical standard diving dress which revolutionised underwater civil engineering, underwater salvage, commercial diving and naval diving. Historically, deep sea diving helmets ranged from the no bolt to two bolt to four bolt helmets; helmets with six, eight, or 12 bolts; and Two-Three, Twelve-Four, and Twelve-Six bolt helmets. Bolts being the method of securing the helmet to the diving suit. The helmet could also be secured to the breastplate (corselet) by bolts as in the case of US twelve-four helmets (12 bolts to the suit, four bolts seal helmet to corselet). The no-bolt helmet used a spring-loaded clamp to secure the helmet to corselet over the suit. 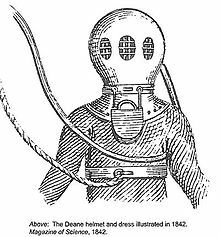 Swedish helmets were distinctive for using a neck ring instead of a corselet, a pioneer of modern diving equipment but hugely cumbersome and uncomfortable for the diver. This equipment is commonly referred to as Standard diving dress and "heavy gear." The US Navy Mk V helmet was still in production to order. In 2016 DESCO Corporation purchased the assets of Morse Diving International and began producing Morse helmets under the A. J. Morse and Son brand. The US Navy Mark V Helmet is available in either make with the minor manufacturing differences intact. While the Mark V is a US Navy design and all helmets should have been identical models from Morse, Schrader, DESCO, and Miller Dunn all had differences. Brails from a Miller Dunn are difficult to fit on another maker's helmet. Early Miller Dunn Mark V helmets had gussets on the interior radius of the air and communication elbows. Schrader Mark V helmets used yellow brass castings instead of red brass like other makers. Schrader also canted their spitcock body. The standard Mk V weighs approximately 55 lb (25 kg) complete. An alternative to the diving helmet that allows communication with the surface is the full face diving mask. These cover the diver's face and are held onto their head by adjustable straps. "Diving helmet" may also refer to a rigid safety helmet like a workman's helmet that covers the top and back of the head, but is not sealed. These may be worn with a full-face mask to provide impact protection. ^ Curley, MD (1986). "Human Factors Evaluation of the Superlite 37B Helmet in the Surface- Supplied, Open-Circuit Mode". US Navy Experimental Diving Unit Technical Report. NEDU-11-85. Retrieved 2008-09-09. ^ Mitchell, Simon J; Bennett, Michael H; Bird, Nick; Doolette, David J; Hobbs, Gene W; Kay, Edward; Moon, Richard E; Neuman, Tom S; Vann, Richard D; Walker, Richard; Wyatt, HA (2012). "Recommendations for rescue of a submerged unresponsive compressed-gas diver". Undersea & Hyperbaric Medicine. 39 (6): 1099–108. PMID 23342767. Retrieved 2013-03-03. ^ a b Acott, C. (1999). "JS Haldane, JBS Haldane, L Hill, and A Siebe: A brief resume of their lives". South Pacific Underwater Medicine Society Journal. 29 (3). ISSN 0813-1988. OCLC 16986801. Retrieved 2008-07-13. ^ Cardoza, Rod. "The U.S. Navy Mark V - Diving deep into authentication". Retrieved 2013-12-18. ^ Staff. "DESCO 29019 Mark V Diving Helmet - Navy Helium Helmet with Single Exhaust Valve (early version)". Retrieved 2018-02-15. ^ "Kirby Morgan DSI dive helmets" (PDF). kirbymorgan.com. Retrieved 2016-09-07. 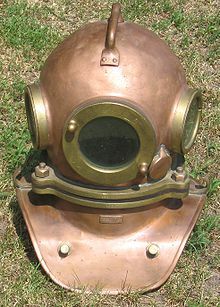 ^ "Lama dive helmet". divingheritage.com. Retrieved 2016-09-07. This page was last edited on 22 April 2019, at 12:01 (UTC).